So listen to what’s been happening to me lately. I’ve been seriously craving the Pizza Hut dinner box. I mean… SERIOUSLY. Yes, Pizza Hut. Please tell me you’ve seen it advertised. Now I firmly believe that people in this world are cut from two cloths: those who love Pizza Hut, and those who hate it. I, unabashedly, adore it and have since I was a child. Which didn’t help my cause, considering alllll my family members – including that guy I’m now married to – decided that they would rather have the hometown pizza joint’s pizza instead of the mass chain produced pie almost every.single.freaking.time. Okay. Whatever. I totally understand. Sometimes I want that too. I’m not saying that the hometown pizza isn’t delicious. It usually is. But Pizza Hut is, like… Pizza Hut. It’s always the same. And it’s comforting to know that if I order a pan pizza, I’m going to ingest one of the thickest but fluffiest but chewiest smothered-in-butter, crunchy on the outside and soft on the inside crusts. And if I order a thin crust, I’m going to get super slim and crispy crust and pretend that I’m eating healthy pizza with extra cheese, which is delicious even if you have to eat six pieces just to feel full. The fact is that I love food so much (I mean, like SO MUCH) that every singly solitary bite I put in my mouth? I want it to be fabulous. I want to 100% love it. I want to live it. I want it to thrill me. And more often than not, I want it to make me feel good. No… great. Or amazing. I am no where near a snob about my eats. It’s just that since we want to love, enjoy and FLIP OUT over nearly every bite we take? We spend time choosing what we will be eating during the week, especially if it includes going out to a restaurant. Really? We just want to freaking love it. I want to remember it. Hence why I’ve been suffering through each and every Pizza Hut dinner box commercial for about three weeks. Going out for a nice little date or getting a $10 dinner box? Easy delicious. Actually, I’m lying. The real reason I’ve been suffering? Is, uh… because I was embarrassed to tell my husband that no, I really don’t want to go out for filet with lobster sauce or pear gorgonzola pizza. I’d rather sit here in my sweat pants and order the damn PIZZA HUT DINNER BOX! Food blog what?? I just caaaaaan’t stop thinking about how good it sounds. Hmmmmm. Okay. Communication wins again. So… we still haven’t ordered the Pizza Hut dinner box. I think we had full plans on doing so this weekend, but… but… then I made this. A few weeks ago while traveling, my husband had a garlic bread pizza crust and didn’t really stop talking about. I didn’t stop thinking about it. I increased my go-to dough recipe a bit for a thicker, fluffier crust, then covered every square inch with melted butter and garlic and even parmesan. In a large bowl, combine water, yeast, honey and olive oil. Mix with a spoon, then let sit until foamy, about 10 minutes. Add in 2 1/2 cups flour, salt, garlic powder and dried basil, stirring with a spoon until the dough comes together but it still sticky. Using your hands, form the dough into a ball and work the additional 1/2 cup flour (you don’t need to use all if it is not needed) in to the dough, kneading it on a floured surface for a few minutes. Rub the same bowl with olive oil then place the dough inside, turning to coat. Cover with a towel and place in a warm place to rise for about 1 1/2 hours. After the dough has risen, punch it down and place it back on the floured surface. Using a roll pin or your hands, form it into your desired shape (sometimes I use baking sheets and do rectangles or free form pizzas). Place the towel back over the dough and let sit in the warm place for 10 minutes. While the dough is rising again, melt 3 tablespoons of butter. Mix it with the garlic and 1 tablespoon of parmesan cheese. Bring the dough back out and using a spoon or pastry brush, douse the outside edges with the butter and garlic mixture. You can spread the butter all over, just make sure to focus on the edges. Use it all up! Continue to make your pizza with your desired toppings. Bake the pizza for 23-25 minutes (or longer if needed, depending on your toppings), or until crust and cheese are both golden. While pizza is baking, melt remaining butter and combine with the last tablespoon of parmesan. Remove pizza from over and immediately brush the outside edges with parmesan butter, using it all up. Sprinkle a bit of parmesan over top if desired. Serve! Note: I realize that if you buy yeast in the packets, it can be a pain to measure 3 teaspoons. If you don’t want to do that, I suggest making a double recipe of this crust. However! I also prefer buying jars of yeast these days instead of packets, and just keeping it in the fridge, so I suggest doing that. Brown Sugar Cupcakes with Peanut Butter Brown Sugar Frosting. We are PIZZA LOVERS….. For sure I will be doing this tomorrow! My spouse is always asking if they still make those “breakfast pizzas” anymore???? Well now, I’ll make the crust and he can create away!! I’m a Texas gal…. love pizza over BBQ!! I just made 2 pizzas using your crust. I am not able to taste it because I am allergic to wheat, but I am hearing good things so far :) The first one rose really high and now I know to poke the dough up to the crust… The 2nd one, I immediately put the garlic butter on it and popped it in the oven. I baked it first for about 15 minutes and I upped the temp to 400 F. Then I put the toppings on and bake for another 15 to 20 minutes. Looks so good too! Thanks for an awesome recipe and I think I will make this to make bread sticks. I make this gluten-free. It’s amazing! I just discovered your blog and can’t wait to try this crust at home. Any suggestions for what to use if you don’t have a peel? I love the humorous and enthusiastic tone of your writing and that you aren’t a food snob. I’m in heaven right now because Pizza Hut’s crust isn’t as greasy as it used to be, plus they now offer an alfredo sauce option in addition to the red. Current favorite is all veggies with alfredo sauce on original crust. I have used this recipe several times and it is a win in our household. Thanks so much for sharing and saving us the money and calories of all that is papa Johns. This turned out great. I did use bread flour though. I’m wondering if I used a solid pan and added oil would it turn into a pan crust type pizza? 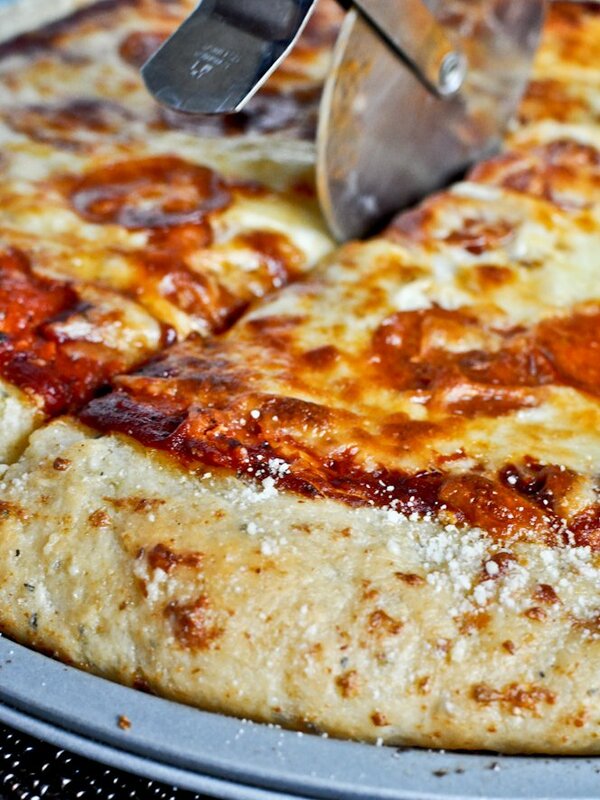 Have you ever made a deep dish pan pizza using this recipe? This is a great recipe! I love adding more flavor where ever possible and this pizza crust packs a punch! I’m lazy and decided to put everything into my bread machine and use the dough cycle and it came out wonderfully! I used it to make my Santa Satchel Pizza Presents. You can see my creation at homemadeprofessional.com! Thank you for the great recipe!